It all started early on a Saturday morning, slamming back a coffee and hastily gobbling up some high energy breakfast. We jumped in the car and sped off (within the speed limit!) around the Tasman bay. 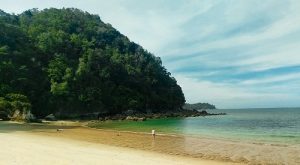 Travelling from Nelson City to Marahau taking only an hour on the small highway and then up and over a little hill and being greeted by a beautiful site- Sandy Bay. 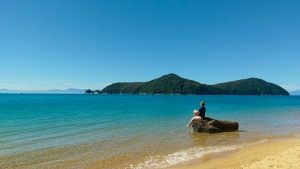 Sandy Bay is the first real view of the Abel Tasman National Park, it takes away your breath. 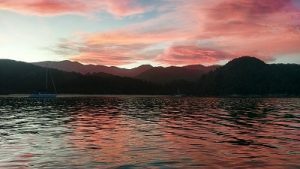 You probably have already done you research on the Abel Tasman National Park so I won’t bore you with facts, suffice to say it is unique, beautiful and now holds a special place in my heart. Jumping on an Aquataxi we wizz off across the bay, north past Adele Island and into another bay called Anchorage . If first impressions were anything to go by then this was going to be a stunning day. To describe Anchorage as a perfect beach is not quite fair, but it is as close as you will ever get. This would be our base for the next 24 hours and what a base it turned out to be. Not stopping for long, we sorted out kit, wet suits, helmet, harness and gear all into a bundle. Ready to hike we set off from the beach into the bush. Steep at first but not too bad, following the guides who knew every path like the back of their hands. 25 minutes later we stopped for a quick rest, drink and a local story from one of the guides (I will leave the content of that story for the guides to tell when you go on an adventure with them!). After slurping down our juice we headed onward and upward! In total we walked for about 1 hour, taking in the views of the Abel Tasman from a higher elevation, listening to cheeping of the local wildlife and soaking in luscious native bush. All of a sudden we could hear the cascading thunder of water. Quick drop down a path had us at the top of the canyon. Lunch, safety briefing, then we were away. First swimming in the cool river to a quick slide down the ravine. The view of the canyon beneath us opening up to show blue sky above, emerald walls of the bush and the torrent of rushing water. What an amazing feeling to be in such a secluded and raw natural place. Scrambling on rocks we reached our first jump, 6 meters high! The guides placing safety first giving us the hints and tips to make this jump right. Looking up, committing and reaching for the sky I launched myself off the jump, the exhilaration immediately hit. “BOOM! This is what it is all about!” I thought as I folded my arms across my chest into a safety position and plunged deep into the beautiful crystal clear water of the Torrent River. Bursting to the surface I made a fist and put my hand on the top of my helmet, showing Oscar the sign that I was all ok and I swam to the side to watch my comrades making their own leap into the sky! Little did I realise at that point that this was only the beginning. The next few bends in the canyon opened up more adrenaline filled treasures! 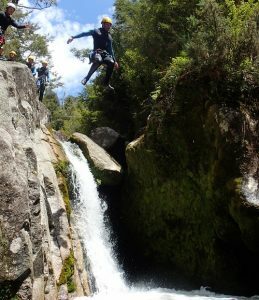 A zip line, followed by water slides, a backwards slide, a magic carpet slide, a massive zip line into a plunge pool and onward and downward we went. Excitement, adrenaline and team work all the way down the canyon. To say this was one of the best adventure days I have had would be an understatement. Everyone left the gorge with a grin on their face. As a keen outdoor enthusiast myself I was impressed with the professionalism of the guides, but even more so I was awestruck by the amazing outdoor adrenaline junkie playground they had found. Torrent River is excellent! Canyon fun and games over, the guides from Abel Tasman Canyons took us back down to Anchorage bay where we had chance to chill-out. Most of our party had to unfortunately leave the park and head to Marahau, but a lucky few of us were able to stay for the next stage of our adventure. 5pm arrived, and we went and stood by a little sign post on the beach, 200meters off shore a man in a dingy sees us and speeds over to us. Ahoy! Before we knew it we were boarding Aquapackers, 4 decked floating accommodation. Shoes off, and a quick tour of the boat, then up beyond the top deck to the roof. Why up the roof of a boat you might ask? Well it seems the only obvious answer to that after a day in the canyon is to launch into a dive straight back into the sea! This is the life! Time to relax finally arrived, a splendid BBQ dinner cooked by Mark and Jane (boat owners) with many amazing side dishes, a cheeky cider and a few beers and we were content. With the sun setting , we had a communal card game with all of the other guests on the back packers. Big grins and laughs all around. 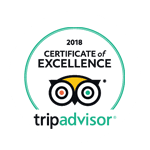 A super special place indeed! Midnight arrived, flicking all of the lights off on the boat we all marveled at the stars, not a drop of light pollution here. Stars that you have never seen, stretching from horizon to mountain. Unbelievable and to be honest I thought nothing is better than this, until one bright spark suggests we go for a night swim. Splash! Brrrr! And wow the stars are even more impressive from the inky black water of Anchorage bay. Now I’m ready for bed. The next morning we woke to day two of our adventure…. the bird part you know already. Not thinking I was even hungry after last night’s feast, the spread for breakfast was amazing. Wolfing down perfectly made pancakes, lovely coffee and some fresh fruit I was then ready for the day! Saying goodbye to Mark and Jane our gracious hosts, four of us; two Brits, one Dane and a lady from Turkey set off hiking away from beautiful Anchorage, to another beach called Observation beach. Tramping (hiking to us Brits) through the native green lush bush, soaking in the morning rays and chatting about the world and all its marvels. On route quickly stopping at the apex of the hill to take in the stunning view across Tasman bay back towards Nelson and the mountains beyond. In the moment gives me goose bumps. Wow, what a place, what a view, what a country. Inspired , our international crew tramped onwards and downwards towards Observation bay. HA! Could it be have we trumped Anchorage with a better beach! Seeing two heads in the water we realise two more of our backpacking crew had made it there too. The party of six now all getting into the sea for a much needed morning swim….along the with a couple of Oystercatchers, naturally. 2 hours later after chilling, swimming, jumping off rocks and generally making the most of a private beach we spot, in the distant bay, a little flotilla heading towards us. Soon a fleet of kayaks arrive. “Hi, yes” we call back. “Ok great! 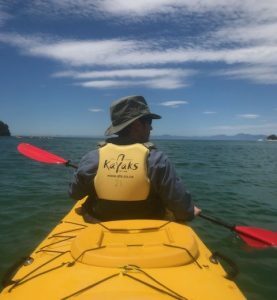 Then you’re with me and I have some lunch for you.” said Sarah, the instructor from Abel Tasman Kayaks. At that moment we realise that all of that chilling, swimming and jumping off rocks has actually built up a rather large appetite and we scoff the food like it’s going to swim away. 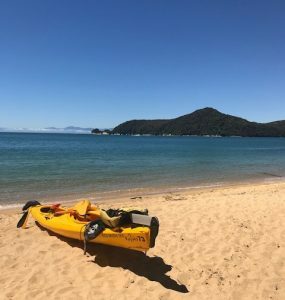 After another efficient, concise briefing and delivery of more kayaks, we were on the water, heading towards the island in the bay, Adele Island (not named after the singer!). Approaching at some speed we slowed to observe the fur seals sunbathing on the rocks. These furry looking sea Labradors did not seem to be bothered by our presence in the slightest, but Sarah pointed out that we are in their home and we should not linger for long. Erring on the side of caution we moved along the edge of the island, listening to the to the avian chorus coming from the tree covered cliffs. Spotting more Fur Seals, Australian Pied Cormorants and Australasian Gannets as we go. 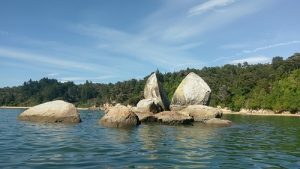 With a little time to spare we head to little visited Fisherman island, the cliffs and coves showing amazing rock formations littered with yet more Fur Seals. Our guide regales stories of long ago explorers as we paddle on until we spot Marahau. We set sights for the beach , furiously paddling to make the distance across the bay.